Sheridan College in Brampton, will host the second annual NPA National Championship tournament, March 1-4, featuring programs from all over the country, battling for the crown. Featured prospects include NPH Top-10 ranked (2018), Jashon Henry, and the #1 player in the country for the 2019 class in AJ Lawson. NPA teams have been progressing over the season, with Saskatchewan’s Notre Dame holding the top spot in the Western Conference (8-0) while Central Tech and Canada Topflight Academy are tied for #1 in the Eastern Conference, both at 11-1 respectively. Full standings can be found here. The City of Brampton and Mayor Linda Jeffrey are pleased to be hosting this national basketball event, and will be in attendance to toss up the ceremonial championship tip-off on March 4. Brampton City councillor, Gurpreet Dhillon, also an advocate of the game, spoke about NPA Nationals being held in the city. “Brampton has established itself as a centre of basketball in Canada, producing an abundance of NBA and NCAA level talent from the ground up. As a Councillor and basketball fan, I am excited that the NPA Nationals will be hosted by Brampton this year at Sheridan College,” said Dhillon. Team rankings and previews will be released next week. Reigning National champs Canada TopFlight Academy edged out London Basketball Academy to become the first-ever to hold the crown. Will CTA repeat or is someone else ready to step up and take the crown? 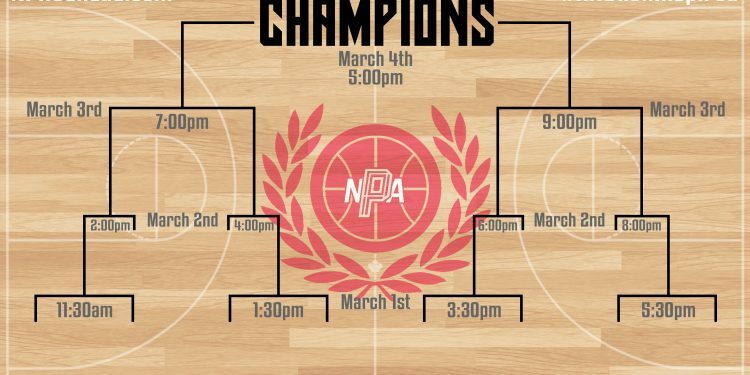 Visit NPACanada.com for schedule, results and stats. Follow the NPA and NPH on Twitter for up to date news on everything NPA and Canadian basketball.